Purchase your fireplace from the company specializing in beautiful, high quality fireplaces. The gas fireplaces for sale at eFireplaceStore.com are an excellent addition to your home. We carry the highest quality ventless gas fireplaces and direct vent gas fireplaces in a variety of designs to fit any home. Whether you prefer a sleek and contemporary gas fireplace, a double sided fireplace or a traditional hearth, you will find the lowest price on your selection. All gas fireplaces are backed by our 110% Best Price Policy, meaning that if you find your fireplace offered for less elsewhere, we'll beat it. Additionally, all gas fireplaces ship to you for FREE. 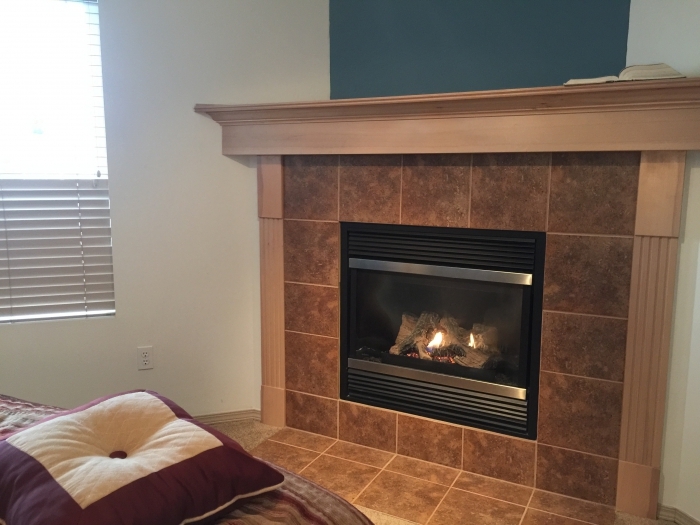 Do you already have a gas fireplace and are looking for a more traditional option? Consider the timeless appeal of our wood burning fireplaces. We also offer all the venting needed for both our gas and wood models, making your fireplace buying experience even easier. What is the difference between a millivolt fireplace and an IPI fireplace? These terms are often mentioned, but rarely gone into with depth and clarity. A millivolt gas valve is a common apparatus that is used in many types of gas appliances. It operates by utilizing a valve containing an electromagnet, attached to a plunger that controls gas flow. Within the combustion chamber and usually directly above the burner is a pilot assembly, which consists of a small gas tube, a thermocouple or thermopile, and an ignitor in most cases. A thermocouple is a small metallic probe that contains a juncture of two dissimilar metals. When heated, the resistance between the metals creates a very small amount of voltage. A thermopile is simply a larger version of a thermocouple and contains multiple chains of these linked junctures. A millivolt style of fireplace will have a manual push knob that initiates the flow of gas to the pilot tube. Utilizing the push button ignitor or a manual lighter, the gas exiting the pilot tube will ignite and begin to heat the thermocouple or thermopile. The resulting voltage being generated will travel back to the gas valve via a copper lead, energizing the electromagnet in the valve. When fully charged, the manual push knob can be released, allowing the pilot to remain lit and the appliance to commence operation. Voltage generated by the pilot is all that is needed for the appliance to work, making this a great low maintenance fireplace, at the cost of a small amount of gas being consumed. An IPI (intermittent pilot ignition) appliance has similiarities to a millivolt appliance. It still uses a gas valve and pilot assembly, but the pilot is not always lit as with a millivolt appliance. Instead, the appliance only lights the pilot when the system is calling for operation. When switched on, an electric spark ignitor begins to fire at the pilot assembly until the flow of gas coming from the pilot tube lights. The flame from the pilot heats a flame rectifier, which is similar to a thermocouple. Instead of generating voltage like a thermocouple, a flame rectifier generates a signal that is sent back to a control module in the appliance. When the module detects the signal, the computer logic tells the ignitor to stop firing and the gas valve to open, commencing operation of the burner. When the system is switched off, both the burner and pilot extinguish, saving fuel by not allowing a pilot to burn while in standby. This type of system usually relies on 120 volt power as a primary supply, with batteries as a backup. In recent years, IPI systems have become very reliable and are on track to outsell millivolt systems in the near future. What is the difference between a vent free fireplace and a direct vent fireplace? While they share some basic operating principles, there are several differences between these two appliance types that govern where they may or may not be installed. Direct vent appliances utilize a sealed combustion chamber that ensures they do not consume any oxygen from the room. The chamber is sealed with a gasketed pane of tempered or ceramic glass, which is held in place by bolted or spring loaded clasps. The log set is contained behind the glass and can easily be viewed through it. The direct vent pipe facilitates both the emission of burnt gases to the atmosphere and the intake of combustion gases to fuel the fire. Typically, the inner pipe is responsible for exhaust duties, while the outer handles combustion air. The pipe can be vented vertically and even horizontally, over limited distances. Because of their sealed nature, restrictions on installation are few and far between, with the primary limitation being the need for the vent pipe run. Like direct vent appliances, vent free units use a gas valve and burner apparatus, coupled with a log set, fire stones, or fire glass. However, vent free units use no venting system or glass front. They are able to do this due to a strict limitation on BTU output and requirements imposed on the media they can use over the burner. Because they do not require vent pipe, they are extremely versatile in how they may be installed, however they also have state by state limitations. In states where they are allowed, they can be a fantastic supplemental heat source for limited durations. For additional information and considerations to look into before working with an installer, we recommend reviewing our purchasing missteps article. For the handy homeowners that have already made a selection, our fireplace installation article is a useful guide to get you to the finish line. Does the Empire Tahoe deluxe clean face direct vent gas fireplace with remote ready millivolt control come with gas logs? That fireplace does indeed come with gas logs. An electrical outlet box (receptacle) is factory - provided for the installation of the FBK-100 Single Speed, FBK-200 Variable Speed Automaticand FBK-250 Variable Speed with Thermostatic Switch forced air blower kits which can all be found on our site. do the hearths or mantles pictured come with the fireplaces? I am building a new home and just starting to shop. For the vast majority of our fireplaces, the mantels/hearths pictured with the unit is not included with the purchase. Moreover, most of the time these are custom pieces for the stock photos. However, we do offer some units with corresponding/compatible mantel cabinets for enclosure. Why are gas fireplaces with direct vent from the top more expensive than vent free? Seems counter intuitive. I have a gas fireplace from the 80's and it needs to be replaced. Do I really need to spend $3000.00 dollars for sheet metal lined with ceramic bricks? Direct vent gas fireplaces are more expensive due to the cost of manufacturing, the solid glass front utilize and the engineering involved. Please note we do sell many models in the $1,100-$1,200 price range; the $3,000+ models are typically the high-end luxury models with many bells and whistles. When we look at widths, is the width specified for the glass, or the box? We are trying to figure out the right size for our living room. The fireplace size, 36 or 42, etc., will be the width of the finished opening. This will include the firebox opening and some of the black metal facing and the front glass, with direct vent fireplaces. Can the Superior Model BBV-42RMN B-Vent Gas fireplace flame height be adjusted? This particular model has a fixed flame height that may not be adjusted. Do you need to run the electric fan on a fireplace all the time? No, you do not need to run a fireplace fan constantly. I have a wood burning stove. I want to convert it to a propane fire place. Is this possible? I do not have natural gas in my area. It would depend on the Make and Model of the unit. Some are convertible and some are not. I have a Napoleon W660-0122 remote. I want to get a fireplace that's compatible. Is Napoleon "connector" like a universal thing? No, Napoleon has different remotes for some of their units. For a Majestic model# 39BDVR RN fireplace, where is the thermocouple located and what does it look like? The thermocouple will be attached to your pilot assembly. It is a small cylindrical piece of metal that is being heated by your pilot light. I have a 14 year old Majestic fireplace model# 39BDVR RN with a SIT Nova control knob. When I tried to light the pilot this year, it would not stay lit. I turned the control knob to pilot and lit it with the ignitor switch, held the knob in for 1 minute and released the knob and the pilot light would not stay lit. Your thermocouple is likely not recognizing the pilot flame, which is causing it to shut off when you let go of the knob. You will want to clean the thermocouple with a piece of emery cloth or high grit (1000) sandpaper. This should resolve the issue. Can a 62" ventless gas fireplace, 42000 to 45 BTUs, be installed below a 62" monitor without arming the monitor? At that BTU level, it is not recommended that a monitor be placed above the fireplace. I have a fireplace with a Heatilator to burn wood. It is double walled steel and in between the walls is an air space that circulates the warm air. This has a damper leading into a masonry chimney with a smoke shelve. If I get a vented gas log fireplace and open the damper about 1/2 to 1 inch, would this be sufficient for a 50 to 70 k BTU log set? You are advised to open your damper completely when using a vented gas log set. Is there anyway to heat your house with the units even if the power is out? Our electronic ignition units generally come with battery backup systems that will allow them to turn on in the event of a power outage. Can a natural gas Vermont Castings stove also burn propane? The gas unit needs to use the fuel type indicated on the rating plate, only, unless an approved conversion kit is installed. I have an existing un-vented fireplace. Can I change it to vented? It has to sit against an interior wall. A vent free firebox can not be converted to a vented one, but can be replaced by a vented unit. Installing a direct vent on an interior wall is not an problem. Ventless gas hearth systems will still require a plumber or gas fitter installing a gas line, but they do not require any venting. Initially, the installation cost will subsequently be less than that of a direct vent system, however, these systems are not allowed in all municipalities and do require maintenance more frequently than direct vent systems. 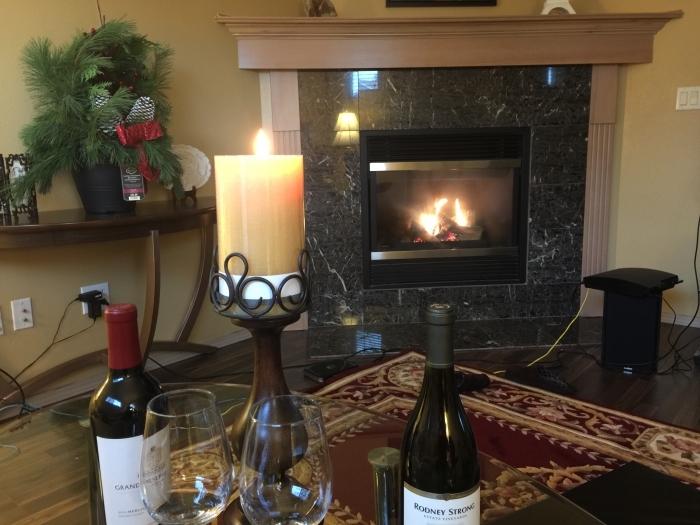 If the concern is initial cost, one consideration should be an Electric Fireplace as not venting would be needed and this would not require a plumber or gas fitter. Can I keep the fireplace glass doors closed while burning a vented gas log set? As long as the doors do not use gaskets to seal them, yes. I highly recommend leaving the doors open for at least the first 15 minutes of operation to ensure that the glass is warmed slowly. This will prevent the possibility of glass breakage, due to thermal shock. Where can I find a gas shut-off valve for a glass fireplace set? If this is simply a natural gas vented burner, this may be operated with the manual key valve that should be installed in the wall or floor outside of your fireplace opening. If this is liquid propane, a safety pilot valve must be installed. In either case, we will need to have the make and model number of the burner to locate a compatible valve. How do you go about removing the glass so as to clean behind it? While it depends on the brand, almost every direct vent gas fireplace requires that you first remove the upper louver assembly, then flip down the lower louvers. There should be 2 or 3 spring loaded clamps that will be visible along the bottom of the glass door frame. They can be pulled forward and dropped down out of the way, allowing you to tilt the glass forward at the base and then lifted up and out of the way. Some older units did not use spring loaded clasps, instead requiring you to loosen bolts that run along the base of the frame. If I have a vented gas fireplace, and I take all of the the insides out, and replace it with a ventless system; will it work? Unfortunately, this is not possible with a vent free fireplace. I have an old freestanding gas fireplace that vents through the roof; it's that older cone-shaped type, if that rings a bell. I am looking for something more contemporary that might replace it. I don't want a "regular fireplace" that goes in the wall or on the wall, but rather, a freestanding fireplace. Do you have any suggestions? The only product we will be able to offer will be one of our woodburning stoves. Do you offer any gas fireplaces that can run without electricity? Yes, all of our millivolt gas fireplaces do not require electricity for operation. We have several models with this ability in each category - direct vent fireplaces, vent-free fireplaces and B-Vent fireplaces. For more information, please see our Gas Fireplace and Stove Buying Guide. Is there any regulation regarding how close to a window you can place a gas(propane) fireplace? By national code for direct vent fireplaces, the edge of the vent termination can be no closer than 12 inches to a door or a window. Most terminations are approximately 12 inches across, so the center line of the vent passing through the wall would need to be approximately 18 inches from the edge of the nearest door or window. When a fireplace is advertised as a 24" or 32" fireplace, does that just mean the box? Or the complete unit with surround? This varies from manufacturer to manufacturer. By and large, the measurement refers to the front width of the fireplace face, including the sides, but in other cases it is the opening measurement. For every fireplace on our website you can download the owner's manual and see the illustrated dimensions which will clarify this. Whats the difference between a "fireplace" and a "firebox"? Generally, when an item is listed as a "firebox," it will not include a gas burner or a log set, whereas a "fireplace" will include the firebox, the burner and the log set. Every unit on our website should clarify what is included. How does one clean the brass or gold plating on the front of the fireplace? A standard brass cleaner should work perfectly well for this application. Gas fireplaces provide an excellent balance of performance, visual appeal, and convenience. This is because propane and natural gas, the two fuels available for gas fireplaces, produce flames that are as attractive as those generated by wood fires, but are cleaner and more efficient. You can also control the strength, color, and appearance of the fire with a remote control. Fireplaces that use gas also have many more installation and venting possibilities than wood burning models. If you choose to purchase a gas appliance you have a large number of direct vent, b-vent, natural vent, and vent-free styles to pick from. * Direct Vent Gas Fireplaces - This uses a coaxial pipe system (a fancy expression to explain a small pipe sitting within a larger pipe). The large outer pipe draws air from the outside to aid combustion, and the inner pipe vents the exhaust. A direct vent gas fireplace offers venting versatility, it is easy to install and it saves space. It also provides maximum warmth, making it ideal for newer or well-insulated homes with no chimney. * B-Vent / Natural Vent - Natural vent gas fireplaces are economical but require a chimney through which to vent the air. They draw in air for combustion from the surrounding room and vent it out above the roofline. These gas fireplaces are a very cost-effective choice and look natural. * Ventless Gas Fireplaces - Comfortable and convenient, ventless gas fireplaces are an excellent choice. They can be installed almost anywhere without a chimney vent, etc. They are inexpensive, warm and have a relatively low operating cost. Although ventless gas fireplaces are designed to meet safety standards, some people are concerned about the indoor air quality. It is important to install a carbon monoxide detector in the room of use, but generally they are perfectly safe if used correctly. Our gas fireplaces for sale are backed by a 30-Day Money-Back Guarantee to ensure your complete satisfaction. We have reputable customer service representatives who have earned us a Five Star Top Service rating with the Yahoo! Shopping Network. If you have any questions or need assistance choosing from the vented gas fireplaces and ventless gas fireplaces offered in our comprehensive selection, they will be happy to assist you.